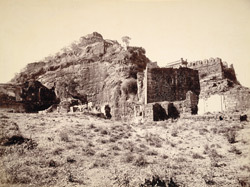 Photograph of the Fort at Daulatabad in Maharashtra, taken in the 1890s, from the Elgin Collection: 'Autumn Tour 1895'. This view is taken from below looking upwards towards the ramparts. In the 9th century the site was known as Devagiri (‘Hill of the Gods’) and was the capital of a confederacy of Hindu tribes. In the 13th century there were attempts to occupy the fort but only in 1327 was it occupied by Muhammad bin Tughluq (r.1325-51). The Sultan renamed the town Daulatabad (‘Abode of the Gods’) and decreed that his entire court should move here from Delhi as it was to become the base for his military campaigns further south. The fort subsequently fell to a number of different ruling dynasties before it was taken by the Marathas in the mid 18th century. The fort, situated on a large conical granite outcrop, has three lines of fortification between the inner and outer walls, the latter enclosing the remains of the original town. A series of underground passages carved into the solid rock lead to the citadel.